JPM is a French body manufacturer producing three-way-tippers, rear tippers, removable tippers and dropsides in steel and aluminium from 3.5t to 7.5t. Production is industrialized and automatized. Market leader in the 3.5t. tipper sector. Well-known for its robust and modular tippers, JPM commercializes its product range all over Europe. In addition to a well implemented distribution network in France, JPM has its own entity in Germany and partners in several European countries. JPM is developing and producing tippers & dropsides since the 70s. The company acquired a strong knowledge and craftsmanship all over the years. 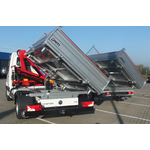 Our three-way-tippers, rear tippers, removable tippers and dropsides in steel and aluminium from 3.5t to 7.5t are well-known for their robustness, modularity and lightness regarding the aluminium product range. All our bodies fit on chassis of LCV car manufacturers and are easily adaptable to different businesses such as civil engineering, public services, landscapers, carpenters or transport services thanks to a common bolt system of our numerous options and at any time. Thanks to an industrialized and automatized production we are able to offer products with a good price performance ratio. Furthermore, bodies are shipped as pre-mounted kits, thus are easy to install for our distributors. JPM is looking for distribution partners all over Europe. Depending on countries we are looking for sales representatives and/or body workers/coach builders. Our distributors are responsible for mounting our tippers and dropsides as well as customer care and service. We provide them technical data, mounting instructions, spare parts, etc.